What Would Sil Campusano Do? Earlier today, Todd Zolecki discussed the roster possibilities for the Phillies when they reinstate Shane Victorino from the DL. One of those, an obvious one for most Phillies fans, involves putting Michael Martinez on waivers and giving the Nationals the chance to reclaim him. Zolecki gives a compelling reason why it won’t happen, but let’s be fair — at this point, it’s obvious that M-Mart has no business taking up space on big league roster. When I look at Martinez, I can’t help but think of Sal Campusano. The sad thing is that for every Dave Hollins, Shane Victorino and David Herndon selected in the Rule 5 draft, there are players like Campusano and Martinez who end up making the teams that selected them and spending time in the bigs. At least with Campusano, the Phillies had an excuse: they were one of the worst teams in baseball and could afford using a roster spot to see if some of the minor league numbers he put up earlier in his career were possibly a real indicator of talent. Maybe, his post-injury 1988 and 1989 numbers were due to taking some time to get his timing back, but, sadly, it quickly became clear that was not the case. As for Martinez, the use of a roster spot for someone of his talent almost seems insane — there’s nothing in his numbers to suggest that he could succeed in the majors, and so far he hasn’t. What makes his presence all the more puzzling is that backup utility players are cheap and readily available, and this year’s club doesn’t have the luxury of carrying a player like Martinez on the roster. I’d like to think that despite their failures while in The Show, players like Martinez and Campusano are trying their hardest and happy just to be there, but that just might be me projecting myself upon them. 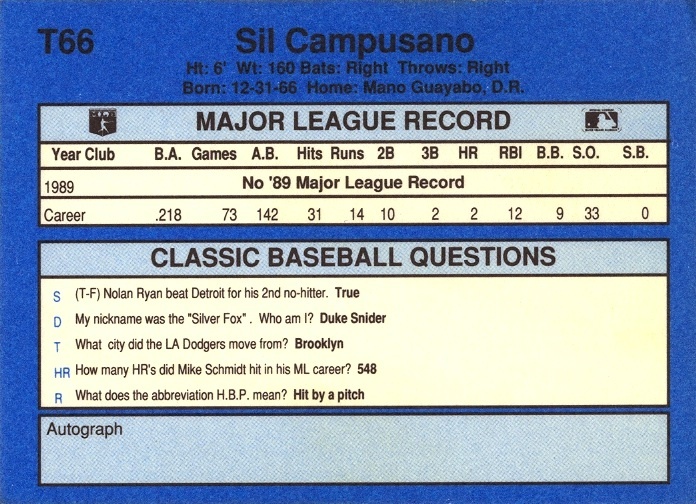 However, the scary thing about Sil Campusano’s career was that it over after the 1991 season, and he was out of baseball before his 26th birthday — at roughly the same age Ryan Howard was when it was announced that he just won the Rookie of the Year Award. When I look at Michael Martinez and consider his age (he turns 29 in September), I can’t help but think that he will ultimately suffer a similar fate after this season. I chose Campusano’s 1990 Classic Yellow, #T66 card for a few reasons. 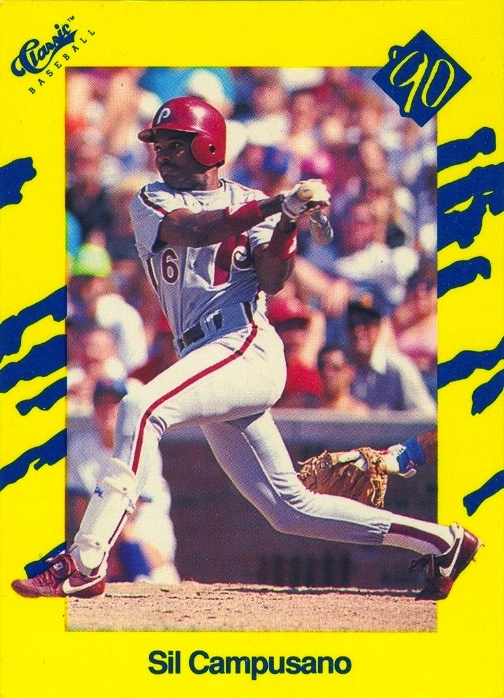 The garish border design on the front is certainly an eye catcher, but what I really loved is that a portion of the back of the card was reserved for obtaining the player’s autograph. I know that collector’s have mixed feelings about obtaining autographs on baseball cards, but I for one do not see a player’s signature on it as defacement — along with baseballs, cards are an obvious, natural item for use in this endeavor. Having said that, leaving a space on the card for this purpose seems silly as there’s just no way to make the blank space left for such an unlikely event look attractive. While putting it on the back does allows the front of the card to look complete (albeit, in this case, an assault on the eyes), no one ever asks the player to autograph it there. In fact, I know of no one who has ever had a player sign the back of the card. It was a nice idea, but Classic proved there was no way to pull it off — just like there is no way Martinez deserves to remain in the majors.